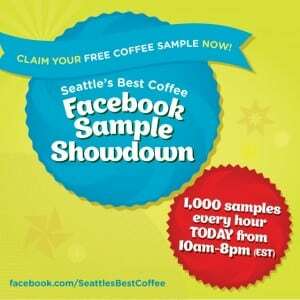 Just a heads up, from 10 am (Eastern Time) till 8 pm (Eastern Time), Seattle’s Best Coffee will be giving away 1,000 free samples of their coffee to the first 1,000 people every hour. To register just click here to visit their facebook and like them. Then at the top of every hour, you should be able to register on the “Seattle’s Best Red Cup” tab. *I tried this one one at 10 am and their page was slow because of everyone on at once, so this one will probably take some patience and refreshing.